This is the first installment in OCEG’s Policy Management Illustrated Series. 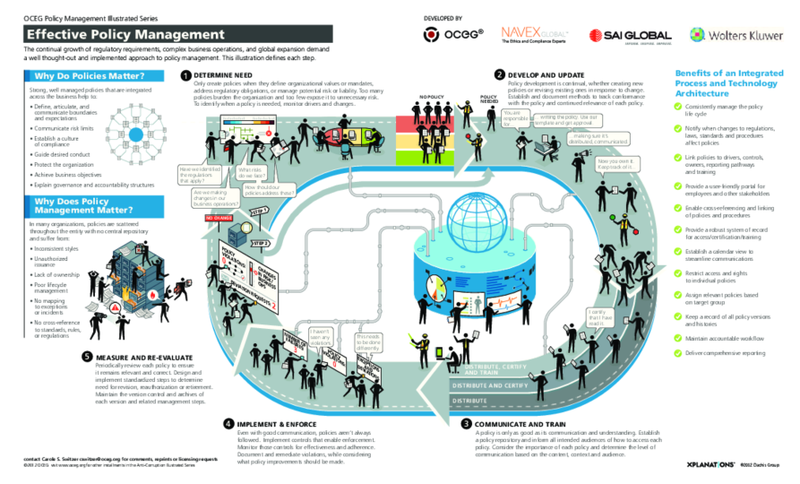 This illustration addresses how an effective policy management process should be structured. The continual growth of regulatory requirements, complex business operations, and global expansion demand a well thought-out and implemented approach to policy management. Learn why policies, and policy management matter, and each of the steps you need to incorporate into your policy management system. We have emailed instructions to access Illustration – Policy Series #1 – How Should We Manage Policies to . Make sure the email arrives in your inbox: either add "support@oceg.org" as a safe sender to your email platform, or if you use Gmail, drag our email into your Primary tab.